Manufactured by Pfizer, this medication works by helping to decrease the side effects of nicotine withdrawal and blocks some of the pleasurable effects that smokers experience when smoking. 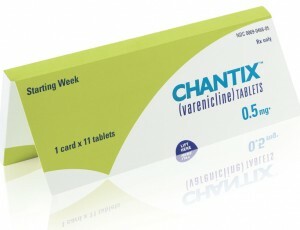 Chantix is unique in that it is one of the few smoking cessation medications that do not contain nicotine. The FDA conducted a priority review after successful clinical trials with very few serious side effects. A number of user complaints relating to suicidal thoughts and actions during treatment with Chantix led the FDA to require the medication to carry a black box warning in 2009. It is effective in smoking cessation because it reduces nicotine cravings, while also making the effects of smoking less enjoyable. Chantix is prescribed to individuals who have not seen success with other smoking cessation aids. It is most effective as part of a complete treatment plan that includes education, counseling, and support. Chantix is available in tablet form and is taken by mouth with a full glass of water. Most patients take a full milligram dose of Chantix twice a day, but your doctor may start your treatment with a half milligram dose for the first week. During this week, Chantix users can continue to smoke, but should plan to quit completely by week two. The FDA has approved the use of Chantix for a period of twelve weeks. Another 12 week session may be administered to individuals who quit smoking during treatment to maximize their chances of success. As with all prescription medications, some patients will experience side effects when using Chantix. It is important for patients to notify their doctor immediately if they suffer from any allergic reaction such as swelling of the lips, face, neck, throat or mouth or if they experience difficulty breathing after taking the medication. Other side effects reported included stomach cramps, abnormal dreams, lethargy, runny nose, drowsiness, weight gain, Gastro esophageal reflux disease (GERD), constipation, changes in appetite, nausea, headaches, insomnia, skin rashes, blisters, dry mouth and gas. While most of these side effects pose no serious threat, the patient should advise their doctor if they worsen. When Chantix is prescribed, it is important for the patient to inform their doctor of any other herbal or pharmaceutical medications that they may be using. Patients who suffer from food, preservative or drug allergies should inform their doctor before using Chantix. If the patient suffers from heart disease, mental illness, suicidal thoughts or behaviors or any form of kidney disease, they should advise their doctor prior to using Chantix. Women who are pregnant, breastfeeding or who are trying to conceive should also advise their doctor of this before using the medication, as it is classed as a Category C medication. This means that safety during pregnancy may not have been fully established yet. At present, no interactions between Chantix and other medications have been reported. However, it is important for the patient to advise their doctor immediately of any interactions or allergic reactions. Currently, there is a patent on Chantix which only expires in 2018. Only once this expires will any generic versions of the drug be made available. Chantix may be expensive, but it will save the smoker a lot of money in the long run by helping them to stop smoking.